Behind the magic story of Fareeva, there is first the story of an exotic islander girl, Maeva. Dreaming of a loving and peaceful world, she is a humanitarian & international development worker, a yoga teacher (see my profile on yogatrail.com) & forever student as well as a soul-based jewelry channeler. Forever a student of the cosmos, inner examinations, deep feelings, alternative experiences, nature, synchronicity, tarot, healing, the sacred strange beauty and all divine mysteries that can be found on Earth and beyond. Maeva, born in Tahiti French Polynesia, grew up in her own magical world light-years away from an ordinary existence in the southern tropical islands of the Pacific Ocean where her mystic eye allowed her to gravitate toward the invisible realms of this world through her highly sensitive perceptions that would forever be part of her human experience. 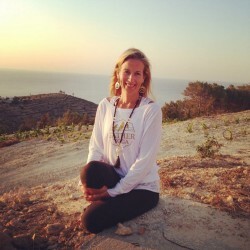 Her path was (and still is) forged and encouraged with a vivid imagination and visions and a life-transforming encounter with the Yogic path fifteen years ago. Her nomadic soul and life have allowed her to keep her mind and heart open and curious to diverse realms of existence. Her heart truly belongs to some of the invisible and sensitive dimensions offered through our cosmic human experience. A romantic and intuitive heart tapping in the magic from Life, Earth and Nature.